Hey there, friends and strangers! Since I'm sure you've all borne witness to the depraved beauty of "The Backwater Gospel" by now, I figured I'd give you a little bonus. I'm offering up the soundtrack to that short film for free download. 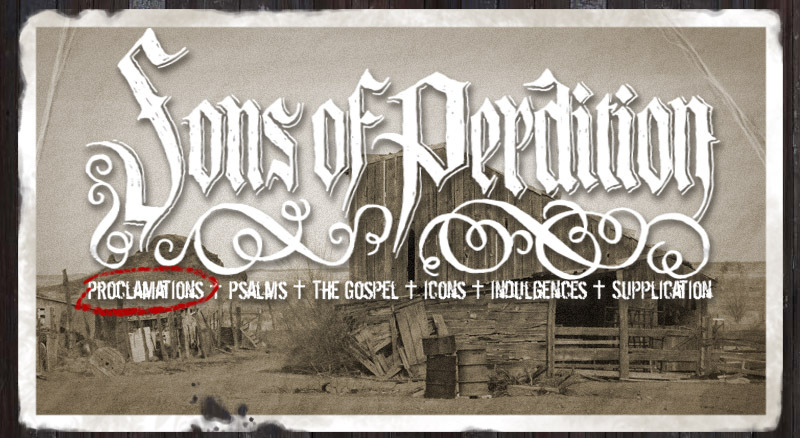 You just have to create an account on www.sonsofperdition.com, and that ain't too hard to do. Once you log in, it will waiting for you like an ashamed child on the My Account page. And if you don't want to create an account because you're off the grid or something, then Hell, just bootleg it. I don't care if people trade this release in the least, so long as nobody makes any money off it. Consider it a public service, doled out on an unsuspecting populace like screams from a slaughterhouse. Along with the songs used in the film, I've included some of my malformed progeny that were hidden away from the release. They didn't quite make the cut in some form or fashion and were left to wither in the detritus pile of dead dreams and leprous thoughts... until now. Let me know what you think about this little endeavor. And in case you're one of the two or three fortunate souls who has managed to avoid it thus far, scroll down to watch "The Backwater Gospel" by clicking on the poster below. It was directed by my good pal Bo Mathorne and is quite the work of art. Tear off those eyelids and prepare to suffer, friend. Thank you very much. I had been wondering if there was gonna be a release of the haunting soundtrack of this amazing animation. Please release youre records on vinyl and don't hesitate to come to Europe. Thank you so much, kind sir, for all the free downloads! You are the best!! Take care. Hell of a thang, Master Whatley. Hell of a thang. I shore do thank ye kindly. Verily and deeply obliged to y'all. I like it a lot, especially Desert wind. Blackwater Gospel is one of the best short animated films I have ever seen!The sound track during the short is awesome as well. I can wait to hear the whole thing! Thank you very much, a day doesn't go by without me listening to these sound tracks, specially the last one. You Guys are Amazing ALL of you perfect sounds! is it the Undertaker song that they sing at the begining middle and end? Is the song that the tramp sings in the beginning available? thanks kind sir for the amaizing songs. How do i download the soundtrack?? Where can I find Tramp's song. "Undertaker song"
Backwater is one of the best shorts I've ever seen! It's exactly the kind of work I hope to do when I finish ky course in animationbl and games. Be proud! And keep it up. Any tips for the wannabe? Is the soundtrack still available for download? I really want to hear the rest of the songs. Bro thanks so much for this man so pimpin you don't even know how excited i was and am about this. Is it still available? I'm curious about it 'cause it led me to your music. And your music led me to pause the noise and keep ears and bones wide open in order to find the strings, fibers and saliva within music. Hey Zeb I love you man and your music has always been an escape for me, and I hope you know that you have a lot of fans out there that support you and love you. I do how ever do have some Questions that keep appearing on YouTube comments and id appreciate it if you did answer them. Thanks. Q)What are your ties and or relationship with bands like Those Poor Bastards,Builders and the butchers and well yeah I guess just lonesome Wyatt himself. Q)What are your views on Christianity and Catholics and Lutherans and what is your belief? Q)Who inspired and or has worked with you in songs in the past? Q) Now this one is a personal question from me but do you know if their will be another black water gospel or what has the director been working on lately? Great thanks to you, pal. I can't download it but thankfully someone uploaded some of the songs to YouTube. Appreciate it greatly.